This is a flash fiction that I included in my creative portfolio last term. Originally, it was part of a writing exercise my instructor assigned. We went to Pioneer Cemetery (our local cemetery on campus) and walked around, finding names for potential characters. Our assignment was to find a name and create a story with them as the main character. At first, I really wanted an unusual name and I did find some really wacky ones, but then I came across a tombstone with a wonderful inscription on it that made an entire story come into my mind. The name was Joseph S. Stiles and the inscription was: Here Lies Woodman of the World. How could a story not come from that? He had, up until now. But there was nothing Joseph could do. The lumber companies had finally found this prize collection of timber and began their destruction. It almost happened over night. They offered jobs to the townsmen, ordinary folks who, like Joseph, had lived and respected the forest all their lives. They had all jumped at the chance to make more money than they had ever seen at one time. Joseph had done the same. Soon, he’d be able to buy a brand new truck. His family had more food on the table and his wife even mentioned that, in a few years, they could move to another town, a bigger town, and not have to live in the backwaters anymore. It would be better for the children, she said. Joseph agreed, but as each day passed, the weight of the axe in his hands grew heavier and it became harder to look at the trees. “You all right, Joe?” His head jerked and Joseph realised that he had stood still for far too long. Walt Humphrey and Nick Reynolds stared at him with large concerned eyes, axes raised, ready to strike the tree again. They were worried. They had all seen men who fainted from overworking themselves, squeezing in a few more hours each day to earn a bit more money, forgetting to drink water or eat food and eventually collapsing, almost catching themselves on the sharp edges of their axe. It was a scary thing to witness, the look some men got in their eyes when all they could think about was getting a few more dollars. Joseph shook his head. “I’m fine. Just need some water.” As the other men nodded, Joe stepped away, keeping his eyes off the mangled tree, and moved to the bucket of water. He lifted the metal ladle to his lips and closed his eyes, feeling the cool water bathe his parched throat. But when he closed his eyes, he was not greeted by comforting blackness. His mind’s eye filled with guilt in the shape of trees. Firs and spruces, their needles the rich blue-green of the ocean. Their limbs shifting and creaking in the wind. Their fresh scent of winter mornings. They called to him, spoke to him, asked him why he hurt them. 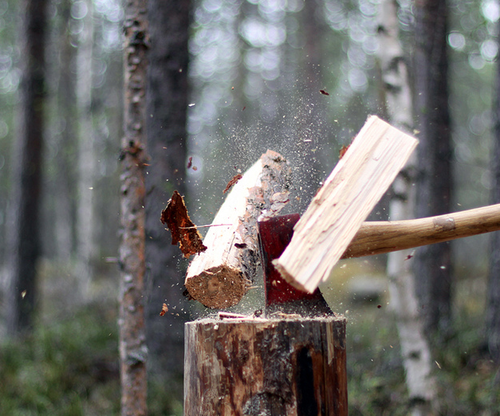 Joseph tried to explain that there was nothing he could do, that even if he were to lay down his axe and never pick it up again other men would still come and cut them down. But they did not care that others would continue the work he was only a small part of. They cared why he did it, why he chose to break his promise. Was it the money? No, Joseph never cared for the stuff, never thought he needed much of it to live. Before the lumber companies came, his family had lived comfortably off of the few dollars he earned selling wood in town. Looking at his friend’s face, Joseph could see the beginnings of the money thirst in the other man’s eyes. They glinted frantically, they darted from one point to another, never staying in one place for long. Soon, Nick would work past sunset and come before dawn, his axe becoming an extension of his arm. Joseph was scared. Scared of what he had gotten himself into. He knew why he had begun work with the others. These men, he knew them all. He had trusted them when they told him this was a good thing. But now, all these men were strangers. Joseph did not want to become a stranger to his wife, to his children. To the trees. Writing Thoughts: Where Do You Get Inspiration?